Pseudo-metallophyte Silene vulgaris frequently colonizes polluted areas. We investigated whether plants obtained under in vitro conditions can be used to form long-term communities on zinc-lead tailings rich in cadmium. To this end, we checked the species stabilization capacity and biochemical properties of the area subjected to long-term cultivation of a local S vulgaris ecotype. We focused on evaluation of its ability to accumulate trace metals (TMs) after 10-year cultivation period. The calamine S. vulgaris ecotype was propagated in vitro and acclimatized to ex vitro conditions in a greenhouse. The plants were then replanted on plots created on the flotation settler heavily polluted with Zn, Pb and Cd. The capacity of trace metal accumulation in plant material was checked based on translocation (TF) and bio-concentration (BCF) factors. Nutrient, TMs content, and enzyme activity of substrate were determined after 1 and 10 years of cultivation and compared with the properties of bare flotation waste. Numerous plants obtained through vegetative in vitro propagation were planted in the field after a short hardening period. Cultivation of plant material obtained this way increased microbial activity, C concentration, and reduced TM contents in the substrate. TF calculated after the first season of S. vulgaris cultivation was similar for all metals and amounted to about 40%. After 10 years, it was the highest for Cd (50%). Independently of the experiment duration, BCF for Zn and Pb was <1, while for Cd it reached about 1.4 after 10 years for both shoots and roots. The calamine S. vulgaris ecotype cloned in tissue culture proved useful material for stabilization of trace metal contaminated post-flotation wastes. Ten years of its cultivation in tailings rich in Zn, Pb and Cd contributed to humus layer formation and increase in microbial activity in the substrate. Thus, the beginning of soil formation was noticed in heavily polluted tailings. Responsible Editor: Antony Van der Ent. Mining of metals and metallurgy industries have resulted in environmental pollution on the global scale (Farmer and Farmer 2000; Cai et al. 2009; Doumas et al. 2018; Sun et al. 2018). In Poland, heavy industry is located mainly in the southern part of the country and it represents one of the major European zinc-lead mining areas (Coppola et al. 2009). In the Olkusz Ore-Bearing Region belonging to the Silesian-Cracow district in southern Poland, metal mining and processing activities, dating back to the medieval times, focused mainly on zinc-lead ores. Abundant zinc-lead sulfides, a series of oxidized Zn-Pb minerals, and galmei ores that contain silver, cadmium and admixtures of other elements have been utilized for centuries in this region. Currently, ore processing in a local mining-metallurgy factory uses a flotation procedure to recover Zn and Pb from ores. This approach generates about one and a half thousand tons of waste annually (Cichy et al. 2016). Satisfactory solutions for reducing the volume of crumbled waste rock deposits from mining processes and post flotation waste are yet to be fully developed. The dumping ground in a shape of a vast post flotation tailing pond covers currently the area of over 100 ha (Pierwoła 2015; Motyka et al. 2017). Revitalization of degraded terrains may be carried out as previously scheduled reclamation or assisted succession masterminded by an interdisciplinary team (Chigbo et al. 2013; Ciarkowska et al. 2017). An ecologically safe and economically advantageous solution would be reinforcing plant communities derived from the secondary succession in order to accelerate recovery of the local vegetation (Ciarkowska and Gambuś 2005; Ciarkowska and Hanus-Fajerska 2008; Pardo et al. 2018). This is particularly important for soilless areas, such as the tailing ponds of post flotation wastes, which are particularly difficult to stabilize and develop a vegetation cover. The only reasonable solution in this case would include planting the representatives of the local flora. An important step in the rehabilitation of mining soilless areas is initiation of soil-forming processes. Covering such terrains with soil limits water and wind erosion by enhancing the soil water capacity. It also limits metals leaching to the surrounding environment. Potential indicators of anthropogenic activities in soil environments are enzymes that in industrialized sites with high metal loads usually show low activity indicating low microbiological diversity. Therefore, an increase in enzyme activity may be regarded as a manifestation of successful rehabilitation efforts (Ciarkowska et al. 2014; Hagmann et al. 2015). The conditions for the occurrence of calamine flora are quite well documented (Dechamps et al. 2011; Rola et al. 2015; Woch et al. 2017). A prevalent feature of such vegetation is a significant share of so-called metallophytes, i.e. plant species that grow on substrates geochemically enriched with metal ions and selectively accumulate different trace metals (Szarek-Łukaszewska and Grodzińska 2011; Ciarkowska et al. 2017). Such species seem to be the best candidates for direct application on terrains degraded by strong anthropogenic pollution. This assumption is supported by some ecophysiological and phytochemical studies carried out by many research teams (Wierzbicka and Panufnik 1998; Ernst et al. 2000; Alvarez et al. 2003). The calamine population of Silene vulgaris is adapted to grow on industrial dumps and waste materials generated during processing of Zn-Pb ores (Chardonnes et al. 1998; Wierzbicka and Panufnik 1998; Nadgórska-Socha et al. 2013). This was also confirmed in our preliminary experiment (Ciarkowska and Hanus-Fajerska 2008). Moreover, considering totipotency of living plant cells, enhanced multiplication efficiency under in vitro conditions could be easily achieved. This approach was exploited during multiplication of valuable plant material for resolving some basic scientific aims, i.e. in studies on drought and nutrient deficiency tolerance in both self and cross-pollinated lines of S. vulgaris from northern Hesse population in Germany (Sandner and Matthies 2016, 2018). Thus, we hypothesized that biotechnological tools were appropriate to propagate Silene vulgaris efficiently, and that propagated material should successfully stabilize flotation tailings. Considering that it is justified to produce the mass-propagated plant material to be applied in a remediation scheme on the post-flotation pond localized in southern Poland, we designed an appropriate experimental scheme. Our first task was to evaluate the in vitro technique and obtain abundant rebalanced material representing calamine population of the studied species. A key stage was a long-term field experiment in which suitability of the propagated S. vulgaris ecotype to grow on flotation tailings was evaluated in two aspects − its remediation potential and enhancement of biochemical and chemical properties of tailings. As an initial plant material, capsules with seeds representing metal-tolerant population of bladder campion (Silene vulgaris (Moench.) Garcke, Caryophyllaceae Juss.) were sampled in July 2006. They were harvested from plants growing on a hundred year old waste heap localized in the Olkusz Ore-Bearing District besides the premises dealing with metallic ores mining. The collected seeds were used to initiate in vitro cultures. They were surface sterilized in 70% ethanol for 1 min., then in 1.5% NaOCl with 0.01% Tween 20 for 25 min., and rinsed several times with sterile distilled water. Afterwards, they were placed in aseptic conditions on a modified Murashige and Skoog medium, containing salts with macro- and microelements, vitamins, and amino acids as per Murashige and Skoog (MS) (1962) but diluted to a quarter strength (¼ MS), and supplemented with 30 g dm−3 sucrose. pH was adjusted to 5.8 prior to the addition of agar (6.5% w/v). The primary explants used to initiate shoot culture were shoot tips with apical meristem, excised from the emerged seedlings. During the shoot multiplication stage, diverse combinations of culture ingredients were applied (Table 1). The following types and concentrations of plant growth regulators (PGRs) were tested in the propagation medium: 0.1–0.5 mg dm−3 α-naphtaleneacetic acid (NAA), 0.1–0.5 mg dm−3 indole-3-butyric acid (IBA), and 0.5–1.0 mg dm−3 benzyladenine (BA). Shoot explants about 15 mm long were randomly taken from the previously established stock culture and dipped into the medium with their basal parts. pH of the micro-cloning medium was 6.4. For solid media, 8% (w/v) agar A-1269 (Sigma Chem. Co, USA) was used. Autoclaving time was 15 min. at 121 °C. We used cylindrical culture flasks of 200 ml capacity filled with 20 ml of the culture medium. Each flask harboured six explants and ten replications were run. All experiments were repeated three times. Micropropagated shoots were evaluated every week and multiplication coefficients were calculated as the number of regenerated shoots per the initial explant. Temperature in the culture room was set to 24 °C ± 2° (day) and 18 °C ± 2° (night). Photosynthetically active radiation (PAR) at the culture level was adjusted to 60 μmol m−2 s−1, with 16/8 h photoperiod provided with cool-white fluorescent light. The best developed micro-shoots (about 30 mm long) were chosen for rooting. Root regeneration was conducted in culture tubes in basic Murashige and Skoog semi-solid medium without PGRs. The rooted micro-plants were removed from the culture vessels, washed with sterile water to remove agar, and planted into 5 cm diameter pots filled with sterile substrate made up of garden soil, perlite, and flotation wastes in 1:1:1 ratio (v/v). The first hardening phase lasted for 3 weeks and plants were kept in a growth chamber at 70% RH, 24 °C ± 2, under PAR 80 μmol m−2 s−1, 16/8 h photoperiod. Plantlets, protected with plastic caps, were sprinkled every day with sterile distilled water. Initially established plants were transferred for another 3 weeks to a shaded mist chamber in the University Greenhouses (RH 50%, 28 °C ± 2) for a second phase of hardening in plastic rings filled with the flotation wastes (FW) taken from the settling pond. The material hardened this way was ready to be replanted in the field. The percentage of hardened plants was evaluated after 21 days of acclimation to ex vitro growth. Microscopic observations were performed at the end of the acclimation to ex vitro conditions and compared to the material obtained as a result of generative propagation. Histological analysis included vegetative organs of R0 regenerates, i.e. the regenerates of the first generation, following 21 days of acclimation to ex vitro conditions. The sections were analyzed with Nicon Eclipse C400 microscope integrated with JVC Digital camera and Image Pro-Plus Program. The study area was situated in the Olkusz Ore-Bearing District, in Boleslaw commune (N 50°17′33″, E 19°28′14″). Field investigations were carried out in the years 2007–2017. Three experimental plots, 6 m2 each, were located within a flat part of the post-flotation settler. A detailed description of the mining history and settler formation was published by Ciarkowska (2017). In the middle of May 2007, we planted on each plot 72 plants obtained by mass propagation and contained in plastic rings (10 cm in diameter and 30 cm tall), filled with about 1 kg of FW. Each plastic ring comprised two plants. We used a total of 216 plants, grown in optimal conditions worked out during experimental mass-propagation stage. The plants used in the field experiment were obtained from a single donor plant, so they constituted a specific clone described as L0 (from the first letter of Polish generic plant name). Designed row spacing was 25 × 25 cm. The plants were abundantly watered only after planting. Then they were cultivated without additional watering and without fertilizing. The experimental plots were checked every April, June, August and October of the growing season. During the experiment, we were removing all remaining or emerging vegetation from around the plastic rings. Flotation waste used as the substrate for the cultivation of S. vulgaris was analyzed three times: before the experiment (FW), after the first growing period – FW1 (without plants) and FW1S (with plants), and after 10 years – FW10 (without plants) and FW10S (with plants). FW1 and FW10 samples were taken from around the plastic rings. Each time three composite samples, one from each experimental plot, were taken to examine the substrate properties. FW, FW1 and FW10 samples were taken from a depth of 0–30 cm, while after the plant cultivation (FW1S and FW10S) we examined separately two layers: 0–10 cm and 10–30 cm. Substrate samples were air dried, sieved through 2 mm mesh, and stored at room temperature until analysis. The first batch comprising 18 plants (6 from each plot) was harvested after the first growing season and the second batch (18 plants) taken in the same way − after 10 years. The remaining plants were left to grow on. Plants collected after the first growing season and at the end of the experiment were thoroughly rinsed with distilled water, roots and shoots separated and oven dried (105 °C) for 12 h and weighed to their dry mass. Soil reaction was determined potentiometrically in soil-water 1: 2.5 suspension. The levels of total nitrogen and carbon were analyzed in solid homogenized substrate samples with the use of TOC–TN 1200 Thermo Euroglas apparatus. The level of organic carbon was calculated as a difference between total and inorganic carbon. Total contents of P, K, Mg, Zn, Pb and Cd were determined in the substrate samples. The samples (2 g) were digested in a mixture of concentrated nitric and perchloric acids. The elemental analyses were performed in solutions with the use of an inductively coupled plasma atomic emission spectrophotometer Perkin-Elmer model Optima 7300 DV (ICP-OES). Quality of the determinations was verified based on the results from trace metal determinations obtained for the internal standard and the certified reference material CRM023–050 – Trace Metals – Sandy Loam 7 (RT Corporation). We measured substrate activity of dehydrogenase (DHA), urease (Urea), and invertase (Inv). DHA activity was established colorimetrically after incubation of the substrate samples for 24 h at 37 °C with a 2,3,5-triphenyltetrazolium chloride solution (TTC). The intensity of coloration was measured with a Beckman DU 600 spectrophotometer at 450 nm (Cassida et al. 1964). Urease activity was determined after incubation of the substrate samples for 2 h at 37 °C with a urea solution. The amount of ammonia left after urea hydrolysis was determined via distillation of ammonia nitrogen from the sample extract using a Kjeltec apparatus (Tabatabai and Brenner 1972). Inv activity was established calorimetrically after incubation of the substrate samples for 24 h at 37 °C with a sucrose solution. The intensity of coloration was measured with a Beckman DU 600 spectrophotometer at 540 nm (Frankenberger and Johanson 1983). Samples (2 g) of the plant material were incinerated in a muffle furnace at 460 °C for 12 h. The ash was dissolved in HNO3 (1: 2) and Zn, Pb and Cd contents were analysed with ICP-OES. The data obtained under in vitro and greenhouse conditions were subjected to one way ANOVA analysis (STATISTICA. PL v 12.0, StatSoft Inc. 2014, Poland), and a post-hoc Fisher’s test was used to reveal statistically significant differences between means at p ≤ 0.05. The values marked with the same letters are not significantly different. One-way analysis of variance (ANOVA) was also applied to determine the differences in the examined substrates grouped according to the time passed: flotation wastes before the experiment establishment (FW), after the first year (FW1), after the first year of the plant cultivation (FW1S), after 10 years (FW10), and after 10 years of the plant cultivation (FW10S). In order to estimate the least significant differences between the mean values of homogenous groups, the post-hoc test with the Bonferroni correction (at p < 0.05) was used. Homogeneity of variance (Levene test) and normality of data were tested as per ANOVA assumptions. When the distribution of data deviated from normal, transformations (ln) were used to normalize the data. Factor analysis (FA) was applied to specify the groups of variables (substrate properties) influenced by the main factors. In order to make the factors more easily interpretable, the Varimax rotation was performed. Pearson’s linear correlation coefficients and standard deviations (SD) were also calculated. Decontaminated seeds obtained from plants representing calamine population of Silene vulgaris, growing in the productive sector of metallic ores mining and converting facility (Fig. 1a, b), retained their vitality. The seed germination rate amounted to 80–85% and surface decontamination resulted in numerous sterile seedlings emerging in about 10 days on ¼ MS. Mean micro-propagation coefficient differed in the media supplemented with IBA/NAA and BA. After 42 days, i.e. 12 days of culture stabilization and of 30-day passage period, it ranged between 7.8 and 9.2 from a single explant. The highest coefficient of vegetative propagation, i.e. nine stems from the initial explant, was obtained for the proliferation medium supplemented with 0.5 mg dm−3 IBA and 1.0 mg dm−3 BA. This treatment yielded the highest number of 459 shoots of different length, of which 426 shoots exceeded 20 mm and were appropriate for rooting (Table 1). The remaining 33 shoots were rejected due to too slow growth rate. Regardless of significant differences in the number of shoots obtained from individual treatments, the number of shoots ready to be rooted (exceeding 20 mm) was similar for all treatments. Therefore, if we take the number of rooted shoots ready to be transplanted into a pot as a criterion of the propagation success, the combination of IBA and BA was more effective than NAA and BA (Table 1). We produced the highest number of shoots suitable for the next step of the study in the medium for bladder campion propagation (Table 1) supplemented with 0.1 mg dm−3 IBA and 0.5 mg dm−3 BA or 0.5 mg dm−3 IBA and 1.0 mg dm−3 BA. Supplementation of the propagation medium with 0.3 mg dm−3 NAA and 0.7 mg dm−3 BA proved less favourable (Table 1). The mass-propagation stage in the presence of NAA and BA lasted for 5 months. During this time, 150 decontaminated seeds yielded 1019 rooted micro-plants. Of these 904 survived the hardening stage (Fig. 2a). The same number of 150 aseptic seedlings grown in the propagation medium with IBA and BA yielded 1110 of micro-plants (Table 1), of which 1022 survived to be planted in experimental field plots (Fig. 2a–d). Bladder campion shoots rooted easily and abundantly regardless of the medium. Mean number of regenerated roots varied from 11 to over 12 per shoot. Anatomical verification of S. vulgaris organs evaluated usability of the obtained material for further growth and development in the metal contaminated site. Adventitious roots initiated and regenerated on the rooting medium showed normal primary cortex to vascular tissue ratio and proper differentiation of vascular elements (data not shown). After transplanting the regenerated micro-plants to the substrate, the roots easily undertook their physiological function. The plant material was successfully acclimatized to ex vitro growing conditions (Fig. 2a–f) in a greenhouse. The plants from the experimental population were similar to the control ones obtained directly from seeds sown in greenhouse conditions. In conclusion, in vitro micropropagation requires very little space and it allows for rapid production of numerous plantlets ready to be used ex vitro after a short hardening period. FW alkaline reaction (pH = 7.4), resulting from the dolomitic ore bearing rock, decreased insignificantly after 10 years of S. vulgaris cultivation (Table 2). The species cultivation caused also a gradual increase in organic C content from a very low value in FW (0.66%), insignificantly higher in 0–10 cm layer of FW1S (0.78%), to significantly higher in both analyzed layers of FW10S – 1.38% in 0–10 cm and 1.12% in 10–30 cm layer. Total N contents followed the same pattern but significant increment of N in the top layer vs. its content in FW was observed already after 1 year of Silene growth (FW1S), followed by further increase at the end of the experiment (FW10S). Control objects (FW1 and FW10) showed insignificant increase in organic C and total N when compared with FW. Substantial changes in the substrate properties occurred for C/N ratio, which amounted to 20.6 in FW and dropped in FW1S to 16.3 and 17.1 in 0–10 cm and 10–30 cm layers, respectively. The lowest C/N ratios, similar to those found in natural soils, were established in the substrate after 10 years of S. vulgaris cultivation (FW10S). They amounted to 11.5 in the top layer and 12.4 in the deeper layer (Table 2). Similarly to C and N contents, control samples without plant cover (FW1 and FW10) showed insignificant changes in C/N ratio vs. FW. Bladder campion plants were cultivated without any fertilization, so as a result of its growth the substrate lost many macronutrients, which was especially visible after the first year of the experiment (Table 3). A significant decrease in P, K and Mg contents in FW1S as compared with FW and FW1 occurred in 0–10 cm layer. After 10 years, these nutrients were still less abundant than in FW and FW10 but higher than in FW1S. P, K and Mg content in the flotation wastes where S. vulgaris was not cultivated (FW1 and FW10) gradually decreased with time but the changes were not significant as compared with FW. Flotation wastes before the experiment contained 15,765 mg Zn kg−1, 5980 mg Pb kg−1 and 84.6 mg Cd kg−1. Cultivation of the studied S. vulgaris ecotype lowered the content of these elements. Significant reduction of Zn, Pb and Cd occurred gradually by a final value of 23.3% for Zn, 23% for Cd and 3% for Pb in 0–10 cm layer (FW10S vs. FW10). In 10–30 cm layer the drop in Zn, Pb and Cd content was much smaller than in the upper layer (Table 3). In the samples without plants (FW1 and FW10) insignificant reduction of trace metal levels was observed in relation to FW. FW demonstrated exceptionally low activity of the studied enzymes, i.e. 0.27 mg TPF kg−1 24 h (DHA), 0.58 mg N-NH4+kg−1 24 h (Urea) and 0.08 mg of inverted sugar kg−1 24 h (Inv) (Fig. 3). These activities did not change significantly in the substrate without plant cover (FW1 and FW10). Contrary to that, DHA and Inv activity spiked after 10 years of the plant cultivation (FW10S). Urease activity also increased in the substrate with plant cultivation (especially in 0–10 cm layer), but the differences were not significant. We observed a strong positive correlation between the activity of all the enzymes and C and N content, and a negative correlation with pH, C/N, K, Zn, Pb and Cd levels (Table 4). Enzyme activity index amounted to 0.23 in FW, 0.26 in FW1 and 0.31 in FW10. 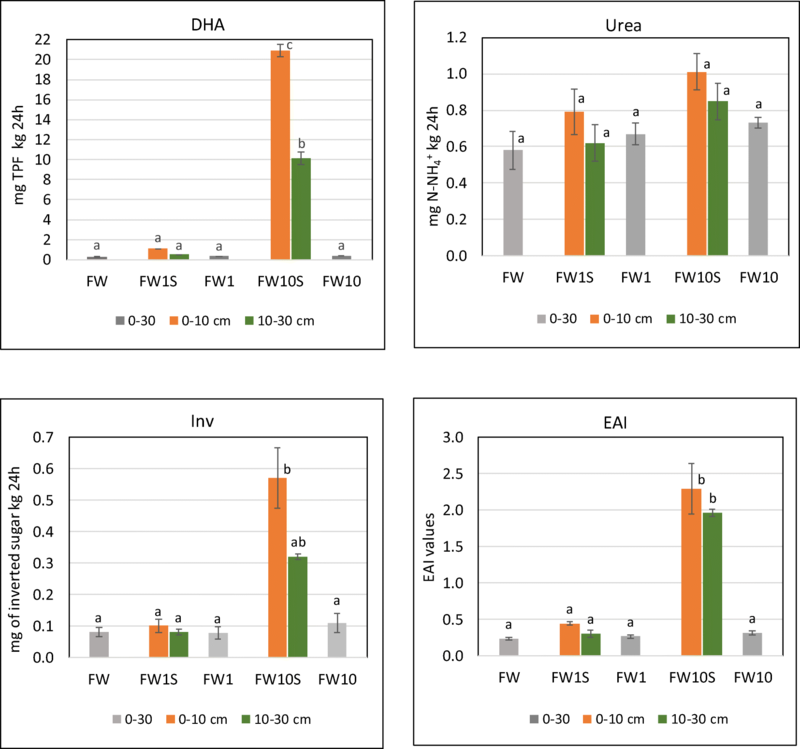 After one year of S. vulgaris cultivation (FW1S) it almost doubled as compared with FW and FW1 in 0–10 cm layer, while in FW10S it increased by over 10 times in the top layer and by about 8.5 times in the deeper layer vs. FW and FW10 (Fig. 3). We conducted factor analysis to explain main factors shaping substrate properties (Table 5). The screened plot and the Kaiser criterion identified three factors that explained 91.34% of the result variability with loads of variables >0.7. Factor FI contained C, N, DHA, Inv and EAI with positive charges and C/N, K and Zn with negative charges. Factor FII contained P, Mg and Pb charged positively, and factor FIII contained pH and Cd with positive charges. Plants evaluated in the experimental field in the first growing period showed intense vegetative growth, high vitality (Fig. 2e), and abundant blooming in the generative phase (Fig. 2f). In such hostile conditions over 90% of S. vulgaris specimens survived. Mean weight of an individual plant during the first growing period was 4.13 g d.w., with roots accounting for 41% and shoots for 59%. Mean weight of 10 year old plants was 23.86 g d.w., with roots and shoots accounting for 49 and 51%, respectively (Table 6). S. vulgaris accumulated more Zn and Pb in the roots than in the shoots independently of the time of plant assessing, while Cd accumulation was similar in both organs. The amounts of all three metals in plant tissues increased significantly after 10 years of plant cultivation as compared with the first year. After 10 years, metal content in the roots was about 2.4 times higher for Zn and Cd, and 1.4 times higher for Pb than after 1 year of growing in FW. For shoots, the amount of Zn, Pb and Cd rose 2.2, 1.5, and 3.6 times, respectively, after ten vs. 10 year of plant growth. Translocation factor (TF1) indicates the percentage of accumulated metal transferred to the above ground organs (Zhang et al. 2010). TF1 calculated after one growing season was similar for all metals and amounted to about 40%. TF1 calculated after 10 years of S. vulgaris cultivation was the lowest for Pb (43%), while for Zn it amounted to 46%. Ten years old bladder campion plants transferred 50% of the accumulated Cd into their shoots (Table 7). Yoon et al. (2006) claimed that the translocation factor (TF2) for Zn and Pb did not differ much between the sampling terms. For Zn and Pb, both TF2 and BCF were below one. TF2 for Cd was low after the first growing season, while after 10 years it reached 0.98. BCF for Cd in roots reached 1.42 and was almost the same for shoots (1.4) (Table 7). Recent years have brought many valuable studies on different aspects of agrobiotechnology (Fotlz et al. 2000; Moeen and Agraval 2017), where scientific teams’ leaders were ambitious enough to achieve far-reaching aims in the near future (Bell et al. 2018). Desirable effects were frequently produced, also in micropropagation of vascular plants of different taxonomic origin (Citadelli et al. 2017; Muszyńska and Hanus-Fajerska 2017; Corteés-Olmos et al. 2018; Suárez et al. 2018). Future prospects depend on successful improvement of the techniques used for obtaining genotypes with enhanced tolerance to abiotic stresses (Wang et al. 2003; Clemens 2017). Further progress in this field requires cooperation of competent teams. Another prerequisite is refining tissue and cell culture methodology. Our results indicate a possibility of using in vitro methods in the remediation scheme of polluted industrial wastes. Vegetative propagation either under in vitro conditions or in the greenhouse should be adopted especially for seeds with reduced germination capacity or seedlings with low survival frequency. Those are standard solutions in horticultural practice and protection of floristic diversity ex situ in the case of valuable cultivars (Klavina et al. 2004; Citadelli et al. 2017; Salama et al. 2018). Elaboration of protocols to ensure efficient mass-propagation of populations growing in the wild is of vital importance. It also concerns numerous populations representing calamine flora or valuable metallophytes (Li et al. 2010; Hanus-Fajerska et al. 2012; Muszyńska and Hanus-Fajerska 2017; Muszyńska et al. 2018a, b). Publications concerning propagation of herbaceous species or vascular plants are more numerous than those reporting proliferative cultures of metallophytes. The latter have been obtained in Europe (Dal Corso et al. 2005; Jack et al. 2005; Vinterhalter et al. 2008; Muszyńska and Hanus-Fajerska 2017; Muszyńska et al. 2018b), Asia (Xu et al. 2008, 2009) and Australia (Bidwell et al. 2001; Bhatia et al. 2002). Initial plant material usually involves seeds, or more rarely shoot explants. Xu and co-workers (2008) experimented with a European population of Thlaspi caerulescens, and regenerated aseptic seedlings similarly as in our work. The investigated ecotype of Silene vulgaris is well adapted to elevated levels of metallic elements in rhizosphere and to growing in dry and nutrient-poor habitats (Wierzbicka and Panufnik 1998; Sandner and Matthies 2016, 2018; Koźmińska et al. 2018). In recent years, research attention has been focused on both phytoremediation potential of metallophytes or metalliferous site adapted plants and their restoration potential (Alvarez et al. 2003; Chigbo et al. 2013; Ciarkowska et al. 2016, 2017; Jamali-Hajiani et al. 2017). The main plant-based technologies used for reclamation of metal-polluted sites include phytoextraction and phytostabilization (Chigbo et al. 2013). The latter is used for large contaminated areas where no other more effective solutions are planned in the near future, and when the key challenge is to prevent penetration of harmful elements into groundwater (Doumas et al. 2018). The process of phytoextraction generally requires translocation of trace metals or metalloids to easily harvestable plant parts, i.e. shoots. Some tolerant plants tend to restrict soil–root and root–shoot transfers, and therefore accumulate low amounts of metals, while hyperaccumulators actively take up and translocate metals into their aboveground organs. 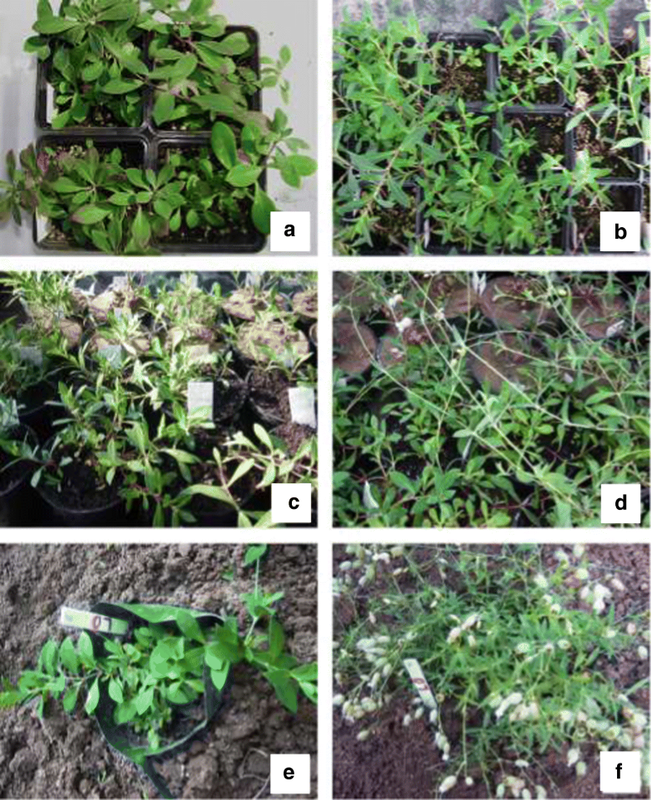 Plants with TF and particularly BCF values below one are unsuitable for phytoextraction but may be efficient in phytostabilization schemes (Yoon et al. 2006; Ferreyroa et al. 2018). Our experiments with S. vulgaris calamine population showed that both Zn and Cd TF coefficients were too low to use this species for effective phytoextraction. Furthermore, we confirmed our assumption that lead was excluded from S. vulgaris shoots. Nevertheless, TF1 calculated after one growing season was similar for all studied metals and amounted to about 40%. After 10 years, this coefficient was the lowest for Pb, (43%) while for Zn it amounted to 46%, and for Cd to 50% of total Cd content accumulated in the plant. Both translocation factor TF2 and bioconcentration factor (BCF) for Zn and Pb did not differ much in particular terms of plant sampling. Moreover, both factors for these metals were below 1. TF2 for Cd was low after the first growing season, while after 10 years it was close to one. BCF for Cd in the roots amounted to 1.42, and to our surprise, it was almost the same (1.4) in the shoots. Translocation factor according to Zhang et al. (2010) is stricter than usually used TF expressing simply the shoot to root ratio for a given metal. In our opinion, TF that indicates percentage content of particular metal transferred to the above ground organs cannot be overestimated. Suitability of S. vulgaris for stabilizing flotation tailings was also evaluated based on the effect the species exerted on the flotation wastes characteristics. We performed factor analysis (FA) to establish main factors shaping the substrate properties. FA revealed three distinct associations between the variables. The first factor (FI) represented C, N, DHA, Inv and EAI with positive charges proving a relationship between these parameters, as the transformation of organic matter components depends on microorganisms. According to Frouz et al. (2008) and Ciarkowska et al. (2016) accumulation and decomposition of organic matter, and thus an increase in C and N content, are major steps of the soil formation process on post-mining sites. The process starts with a formation of humus layer that provides a habitat for microorganisms. This results in an increase of their activity manifested by enhanced DHA and Inv activities. DHA, as an intracellular enzyme, reflects overall microbial activity (Watts et al. 2010), while Inv is responsible for the soil ability to break down sucrose and free simple sugars that are the main energy sources for soil microorganisms (Frankenberger and Johanson 1983). As soil microflora forms an integral component of the ecosystem, its scarcity in metal wastes may result in very slow carbon and nutrient cycling (Tordoff et al. 2000). The presence of enzymes in the first association (FI) emphasized also the role of metal tolerant bacteria that promote plant growth and thus soil formation. Such bacteria are adapted to metal contaminated sites by means of their internal cell modifications and/or the ability to bind or precipitate metals inside or outside their cells (Pacwa-Płociniczak et al. 2018). The structure and diversity of microbial community is affected by both substrate contamination with metals and S. vulgaris root exudates that stimulate or inhibit growth of specific bacterial populations. According to Pacwa-Płociniczak (2018), long-term cultivation of S. vulgaris at metal contaminated sites may more strongly affect the microbial community structure than metal contamination. FI contained also C/N ratio, K and Zn with negative loadings. A decrease in C/N ratio to values similar to those found in natural soils confirms the soil formation on wastes, whereas a decrease in K and Zn amounts results from their uptake by S. vulgaris. Potassium originated from mineral parts of waste rocks. It is often taken in high amounts by plants growing in harsh conditions, as it contributes to the survival of plants exposed to various biotic and abiotic stresses (Wang et al. 2013). A drop in Zn was due to its accumulation by S. vulgaris, which demonstrated the species suitability for growing on Zn-Pb flotation wastes. This allows us to define this factor as the effect of S. vulgaris capability of starting soil formation on flotation tailings. The factor explains about 67% of total variability, which makes it the crucial one. The second factor (FII), which explains 15.7% of total variability, contains P, Mg and Pb, present in similar amounts in the analyzed substrates (FW, FW1, FW1S, FW10 and FW10S). Correlation between P, Mg and other substrate properties, especially soil enzymes was low. Although Pb negatively correlates with enzyme activity, its phytotoxicity is usually much lower than that of Zn and Cd due to its limited bioavailability and uptake from the growth substrate (Hladun et al. 2015). Therefore, the second factor (FII) represents substrate properties that are rather unchangeable, irrespective of the period of S. vulgaris cultivation. The third factor (FIII) describes only pH and Cd, explaining 8.6% of the total variability. It may be associated with Cd mobility and its uptake regulated by pH. Cadmium is chemically similar to zinc, which is an essential micronutrient, and is therefore easily accumulated by plants. Cd may replace Zn in certain enzymes, thus creating less stable protein complexes (Hladun et al. 2015). FA analysis indicated that S. vulgaris cover may facilitate soil formation on the tailings. As a result of the plant cultivation, we observed symptoms of the ecosystem recovery, despite persisting metal contamination. 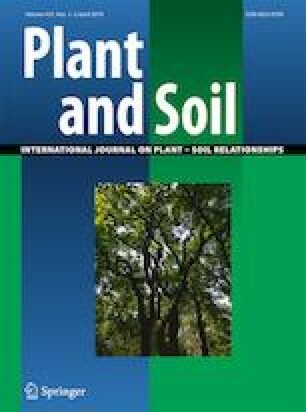 As restoring degraded lands involves also stimulation of soil-forming processes, we chose a substantial increment in the accumulation of organic carbon and total nitrogen, a decrease of C/N ratio as well as an increase in enzyme activity resulting from S. vulgaris cultivation vs. flotation wastes without plant cultivation as criteria for successful beginning of soil formation. In this study we assessed suitability of in vitro cultures for the effective vegetative propagation of calamine Silene vulgaris ecotype with the aim to plant the propagated material on post flotation tailings. We managed to efficiently multiply the studied ecotype and to obtain true to type progeny. This way, we ascertained that this species can be useful in assisted succession on heavily polluted sites. Moreover, using the translocation and bioconcentration factors we demonstrated that such plant material is only capable of stabilizing contaminated areas. We also found that S. vulgaris cultivation facilitates soil formation on highly contaminated tailings. The beginning of pedogenic processes was mainly manifested by humus formation and increased microbial activity. This work was financially supported by the Ministry of Science and Higher Education of the Republic of Poland. Financing of research project NN 523 206537 and co-financing in the form of statutory activity granted to the Institute of Plant Biology and Biotechnology (DS-3504 ZBiFR/15-17) and to the Department of Soil Science and Soil Protection (DS-3138/IGiA/15-17) are greatly acknowledged.